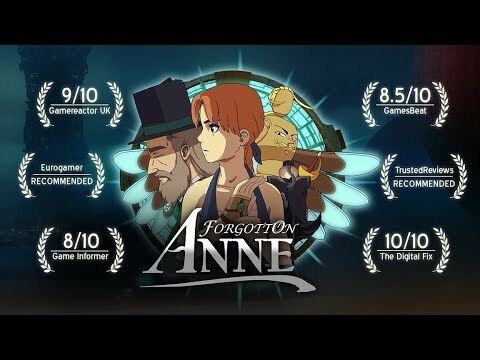 Square Enix Collective has announced it’s bringing 2D adventure game Forgotton Anne to Nintendo Switch in the west in 2019. Forgotton Anne will be available for £15.99/$19.99/€19.99 via Nintendo eShop with a 10% discount for two weeks when it launches. Check out the accolade trailer and first details below. Square Enix Collective® is excited to that announce that, after a successful debut earlier this year, 2D cinematic adventure Forgotton Anne is heading to Nintendo Switch in 2019. The story-driven adventure, set in the beautifully hand-crafted 2D cinematic Forgotten Lands, launched on console and PC back in May. Its forthcoming release on Nintendo Switch means it’ll soon be available on all three major consoles, alongside the PlayStation®4 entertainment system and Xbox One family of devices, including the Xbox One X.
Forgotton Anne reveals the hidden dimension where all mislaid items from the human world – the odd socks, the lost letters, the missing toys – are sent to linger. It’s the job of the Forgotlings – creatures formed out of all of these missing items – to help the trapped Anne and Master Bonku find their way home. The game will launch on Nintendo Switch with a 10% discount for two weeks (normal price £15.99/$19.99/€19.99).